It is becoming an incredibly competitive world for sustainable and renewable energy, as companies must prove themselves beyond just manufacturing and installation. The Iberdrola Group has stepped up to the plate to receive the Dow Jones Sustainability Index (DJSI) acknowledgement as the top sustainable energy utility. This is a title that was well earned, but an incredible task to accomplish, considering the global competition they were up against. 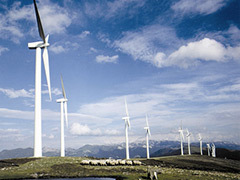 The DJSI title bestowed on Iberdrola is based on some rather high benchmarks of success. Iberdrola is known for their wind energy development, as the world leader with installations in capacities over 14,400 MW around the globe. But Iberdrola has taken their concept of responsibilities to an even higher level through their focus on protecting diversity, fighting climate change, the reduction of the carbon footprint and the encouragement of innovative and eco-efficient technologies. The core business attitude of Iberdrola goes beyond just wind energy, but enters into a commitment in policies for sustainable energy and excellence in corporate governance. They stand as the only international electricity utility to be included in all thirteen editions of the Dow Jones Sustainability Index, and they have demonstrated their strong commitment to the overall protection of the environment. The company has responded to the center design of environmental, economic and social changes that have faced the varying energy policies in the European Union and Spain. Unlike so many companies that say they are conscious of the environment and carbon footprints, Iberdrola has actions that follow these claims. Their environmental dimensions of their operations has been a main priority in their overall business plans and they promote not only production, but eco-efficiency, innovation and the gradual reduction of their activities on the impact on the environment. Iberdrola has developed an incredible array of sustainability projects as part of their scope and have become a true pioneer in the realm of total commitment, from start to finish, in the sustainable energy world. Posted on June 17th under Wind Energy Systems. I wonder if they are looking to hire like-minded professionals? This is the kind of place everyone would like to work in. Who knows, they may also be responsible for changing the attitudes of the bulging pocket corporations of the U.S., because they are thinking about the big picture (not just their wallets). I think the best part about this article is the fact that this company takes environmental concerns seriously. Lots of corporations say they care, but cut corners and ruin nature in the process. They push that part of their tale to the back and make us look at the supposed good they are doing. This is the story of a truly caring company. A rare thing today. It’s about time that we see a company like this that is absolutely committed to the sustainable energy realm. There seems to be a lot of companies that start out being interested, but quickly fade away because of the amount of work and cost. Their record of achievement is being recognized by Dow Jones, which is a lot in itself. Can other companies join them? Only time will tell.